This is a very hard to find rare Eisenberg Original Fish Pin. It is in excellent condition with no damage and measures 3 inches long and 3 inches wide at the widest point. It is signed Eisenberg Original and marked Sterling. It has a beautiful gold wash on silver finish. You will not find a more unusual Eisenberg Original than this. If you would like to see larger pictures check out these links. This is a very spectacular signed Eisenberg Ice Blue Brooch. Eisenberg uses 5 different shades of blue and 3 different cuts in this beautiful piece. It is in very good condition and measures 2 1/4 inches tall and 2 inches wide. It is numbered on the back 6417. A great sparkler for your collection. Although the picture looks like the Rhinestones in this Coro Brooch are clear they are really a very light pale Yellow color, and the other stones are Red. It is in excellent condition and measures 3 1/4 inches long and 1 inch wide. This one screams out Coro, probably 1960s. This is a very pretty unmarked 1970s Silvertone with Blue and Green Rhinestone Brooch. It is in excellent condition and measures 2 1/4 inches at the widest point. It looks like a great piece to be worn in the Winter because of the cool blue color. This eyecatching piece is a 1950s unmarked Rhinestone Bow Tie Brooch Pin. It is in very good condition and measures 1 3/4 inches long and 1 inch wide. You will never tire of the compliments you will get with this pin. This is a great signed Little Nemo signed Brooch with the L/N mark. It is in excellent condition and measures 2 1/4 inches wide and 2 inches tall. It has a beautiful selection of pastel colored stones that will go great with any color outfit. 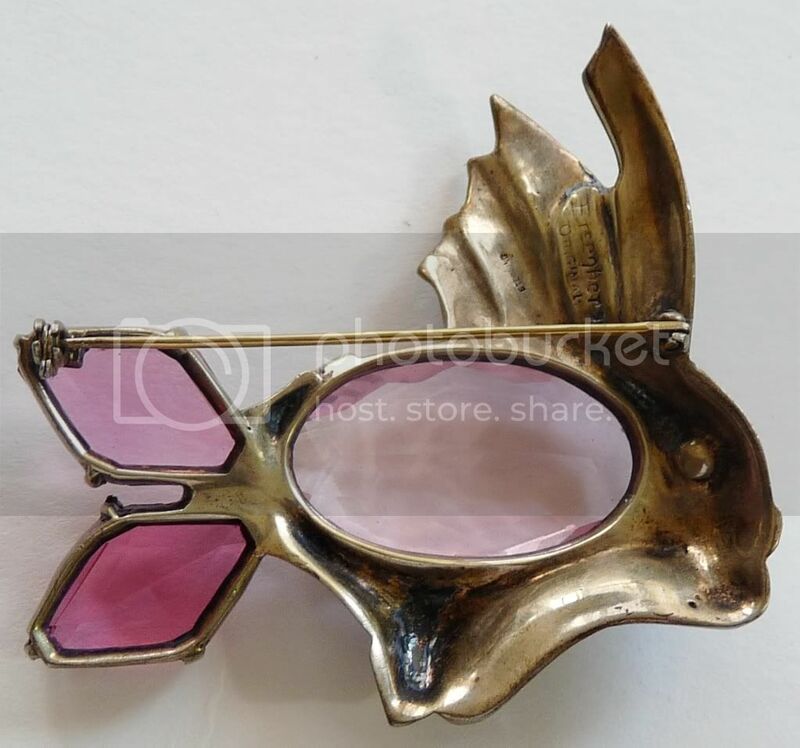 This is a beautiful circa 1930s Dress Clip. It is in very good condition and measures 1 1/4 inch tall and 1 1/4 inch wide. It is marked with the Patent Number 1852188 from the early 1930s. There is some wear on the back of the clip otherwise perfect condition with no dead stones or loss to the enamel. All in all a very nice piece. This is an eyecatching unmarked Twisted Arrow Brooch. It is in excellent condition and measures 3 inches long and 1 1/2 inches at the widest point. It is spectactularly loaded with Pave Rhinestones and Faux Pearls. The quality is evident by the copeious amount of Rhodium used. This is a very nice 1950s unmarked Blue Floral Brooch with Plastic Layered Flowers and Rhinestones.It is in excellent condition and measures 1 7/8 inches across and it stands out about 3/4 of and inch.It is very delicate looking, your friends will just love it. This is an interesting Chatelaine Brooch marked Germany. It looks like silverplate and has a bright Blue Cabochon and three Rhinestones. I am not sure how old it is, but I know it is not new. It measures 1 7/8 inches wide and 2 3/4 inches long to the bottom of the chains. This is a very pretty signed Coro Pinwheel Brooch. It is in excellent condition and measures 2 1/8 inches wide. It is a very stylish Pin to add to your collection. This is a pretty signed Trifari Stylized flower Brooch. It is in excellent condition and measures 2 1/4 inches high and is 2 inches wide. You can't go wrong with the quality of Trifari. This is a magnificent Green Enamel Leaf Shaped brooch made by Gerrys in the1960s. It is in excellent condition and measures 2 1/2 inches long and 1 1/4 inches high. You will love wearing this in the Spring and Fall seasons. This is a beautiful signed Coro Daisy Brooch. It is in very good condition but has some loss to the chrome finish on the front ribbon as you can see, but you have to look hard to see it. It measures 2 1/4 inches long and 1 3/4 inches wide. Although it has flaws it is still very pretty. This is an unusual Black Rose Pin made by BSK, probably 1950s. 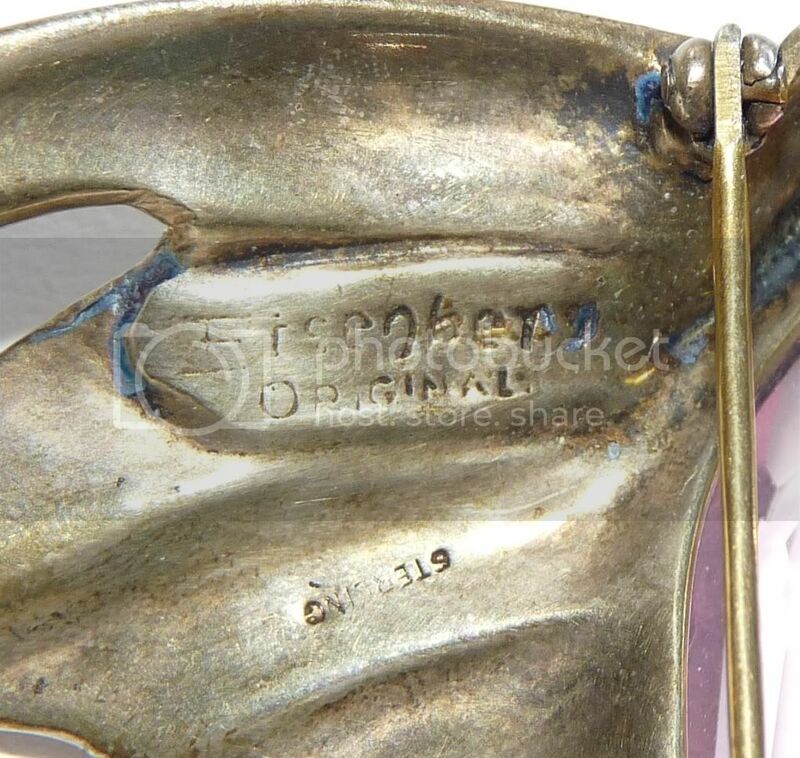 It is in very good condition with just some loss of the chrome color as you can see at the top left, about 1/8 inch. It shows on the photo but you can't see it in person because the background is silver anyway. It measures 3 inches tall and 1 inch wide and is signed BSK. All of the Rhinestones are there and beautiful. You don't see many of these around . 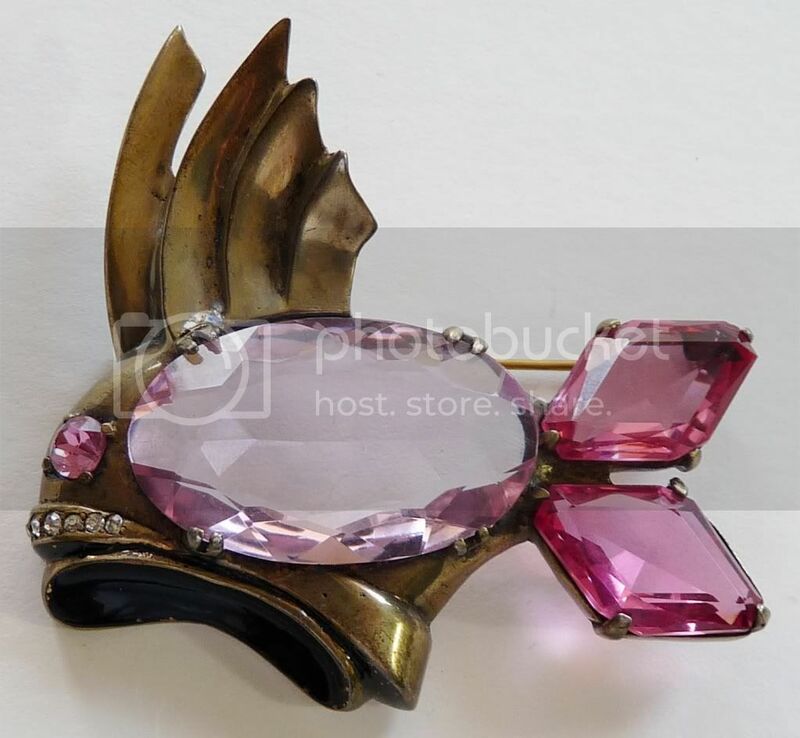 This is a beautiful signed Eisenberg Ice Brooch in a great pink color. It measures 2 1/2 x 1 3/4 inches. It is in excellent condition with very clear stones. This is a fantastic signed Weiss Leaf Brooch in a beautiful Blue Aurora Borealis color. It is in excellent condition and measures 2 7/8 inches long. This one is very appealing to the eye and sure to only go up in value. This is a very nice unmarked Platinum colored pin with faux pearls shaped like a grape cluster. It measures 2 inches long and 1 inch wide and is in excellent condition.